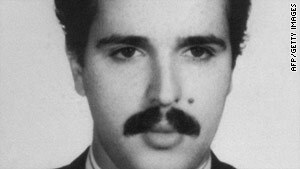 File picture taken in the 1990s shows Ali Vakili Rad. Paris, France (CNN) -- A French court has authorized the release and deportation of Ali Vakili Rad, the convicted assassin of former Iranian prime minister Shahpour Bakhtiar, the French prosecutor's office said Tuesday. Vakili was convicted in 1994 of the bloody stabbing death of Bakhtiar and his personal secretary at Bakhtiar's suburban Paris villa in August 1991. He was sentenced to life in prison with a minimum of 18 years, the Paris High Court said. Vakili had appealed last year to be released, and the court Tuesday granted him a 56-day reduction of his 18-year minimum sentence, the court added. Iranian Foreign Ministry spokesman Ramin Mehanparast said Iran was "pleased" that Vakili would be returning home. French political groups expressed alarm at a possible link between Vakili's release and that of Clotilde Reiss, a French academic who was allowed to return home over the weekend after being held for a year in Iran. Vakili's lawyer told BFM-TV that his client was not released earlier because Reiss continued to be held in Iran. "The liberation of Vakili Rad looked a lot like compensation," Socialist Party spokesman Benoit Hamon told state radio France Info on Tuesday. "Saying that there was no compensation is just assuming people are stupid." "The liberation of Vakili Rad looked a lot like compensation. The deputy spokesman of the right-wing UMP party, Dominique Paille, told the newspaper Liberation that he was outraged by the possible link. Vakili requested to be released on parole and told the court he planned to return to Iran after his release, the High Court said. Because "such a project could not be carried out in the absence of an expulsion measure," the court said, French Interior Minister Brice Hortefeux on Monday ordered Vaikli deported to Iran. "It is within this context that the court, in charge of enforcing penalties, was able to deliver on May 18th, 2010, a decision of release on parole coupled with a deportation measure to Iran," the court said. Prosecutors said Vakili and two other men entered Bakhtiar's villa and hacked at the victims' throats, chests and arms so savagely that a knife blade was broken, Time magazine reported during the trial. The murder was not discovered until two days later, during which time Vakili made his way to Switzerland. Vakili missed a train connection and failed to meet his contact on time in Geneva, however, by which time an international arrest warrant had been issued for his arrest, Time magazine reported. Swiss police arrested Vakili on the shores of Lake Geneva a couple of weeks later and extradited him to France, Time reported. Reiss arrived back in France on Sunday, following a recent ruling by Iranian authorities that paved the way for her departure, the French foreign ministry said. She was among some 4,000 people arrested in connection with protests after the June 12 presidential election last year. Thousands of Iranians demonstrated against the official result of the vote -- the re-election of hard-line President Mahmoud Ahmadinejad. Reiss was released from prison in August and had been confined to the French embassy in Tehran. CNN's Laurine Antoniol contributed to this report.